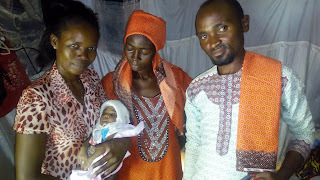 In Kunchingoro internal refugees camp near Abuja, Hauwa is welcomed to the world. In the picture the father, Ali, the mother, Kaita, and a community member. Life is stronger than difficulties if it is accompanied by affection and solidarity.